The finished set will incorporate a single transistor radio circuit I already have working. What I need to find is something for the audio stage that both fits in with the required specification and the parts play list. The project specific requires that the completed set has no more than three transistors, drives a loudspeaker and uses a battery supply of not greater than 3volts. The transistors can only be BC 549, BC 559, BC 327, or BC 337, or any combination. For battery economy the audio stage is to use some demonstrable form of adaptive, or sliding bias, so that the power consumption is relative to the audio output level. This all means that I have to construct my amp with just two transistors, and it will be judged on its audio output, signal sensitivity, and battery economy. The only links I've found so far have been mostly for big power amplifiers, and the smaller ones tend to include transformers that are long obsolete. The output of my detector is @100mV on a strong signal at night time, 20mV during the day. In its present form these signals are developed across a pair of homemade phones of approx 300ohms DC. I just did a Google search for "simple audio amplifier circuit" and got lots of hits. Thanks Mike you're a lamb for trying. 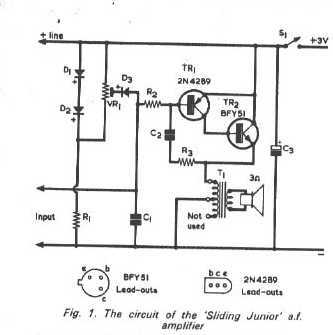 But small single ended power amplifier designs complete with the adaptive/sliding bias (required project specifics) seem thin on the ground, in fact so far I found only one by Douglas Hall that would fit the job, but for an unobtainium transformer. but for an unobtainium transformer. Can you give any details on this "unobtainum" article ? I'm sure I'm not the only one hoping you succeed. But for the low current requirement you need to bias it so at idle the transistor is cut off or close to cut off, then maybe use the other transistor to form a diode pump sort of shape to track the signal envelope and increase the bias of the amplifying circuit to track that envelope. What your requirement doesn't specify is what fidelity is required. I think a copy of spice would be your friend here. pre65 wrote: Can you give any details on this "unobtainum" article ? It was called the "sliding junior" by Sir Douglas Hall. Published by the R&EC magazine in June 1973, I printed out the article at school, I think from the American radio history website. I'm out enjoying the sunshine at the moment, but when I get back, I'll see if I can post a schematic, I don't think I can do it from my phone. The transformer is a Repanco TT 56. Someone on another forum said even that wasn't suitable for the circuit because it was meant for push pull stages not single ended. I don't really understand audio transformer lore, but the article was quite clear was what was needed. I've also been told that circuit could use a "choke" and capacitor output, but they didn't say how And I wouldn't know where to start on that. Nick wrote: But for the low current requirement you need to bias it so at idle the transistor is cut off or close to cut off, then maybe use the other transistor to form a diode pump sort of shape to track the signal envelope and increase the bias of the amplifying circuit to track that envelope. What your requirement doesn't specify is what fidelity is required. I think what you are describing is exactly how the "sliding junior" is supposed to work. In that circuit, diodes are used for the biasing and reference, if that were possible then both transistors could be used for gain. What fidelity, well listenable I suppose, if you are prepared to use MW radio. The teach said aim for 4.5khz bw and as little obvious distortion as it can be designed for. So he's not expecting much HiFi! That Repanco TT56 transformer looks like a push-pull transformer, but not wired as such. I wonder if Steve S has any old data books with the specifications ? Perhaps one of the cheapie Hammond "universal" push-pull output transformers would do instead, or a small toroidal transformer ? I may have Phil, but I'm in the south of France for a few weeks. You boys are the best! The circuit Nick posted is the one so I won't upload it again. If someone could find a transformer I could do payment in kind (with electronique junque that is, valves etc. ) pending apro from Mum, of course, or just buy it outright if the price wasn't too astro. What does anyone think of that choke and capacitor idea? The guy who put that forward stopped talking, another idea was similar as it turned out, the circuit was for an old car radio that would need adapting if possible, I couldn't think how to start with that job, but had even older and more obscure parts. Just looked up OC16. ANYWHO, I've attached the radio detector circuit. Time to pump some Zeds, nite all! Thanks Nick, I've sent an email to repanco just now, one of those transformers from your link may be worth just trying but the ratios seem odd, (I'm told). Well, the output transformer is normally used in the collector circuit of a transistor output stage so will have a higher ratio than ideal, thats why I suggested the driver transformer which may be closer. Yep, thats whats good about this stuff.